Want to know what new van models are going on sale in the coming months - or even years? Looking to replace your existing van and wondering whether to hold out for an all-new model? Then you've come to the right place. On this page you'll find info on the new vans coming soon, plus a recap of recently launched models, too - helping your business make the right buying decision. Don't forget, you can also find new and used vans for sale on Parkers as well. What new vans are coming soon? The key new van arriving soon has got to be the all-new Vauxhall Vivaro, which is on sale now ahead of first deliveries in late July 2019. First public sighting will be at the CV Show 2019 at the end of April. Now based on the same platform and technology as the latest Citroen Dispatch and Peugeot Expert (Vauxhall has recently changed hands and become part of the PSA Peugeot-Citroen group of companies), the new Vivaro will have higher payload and towing ratings than the model it replaces – making this popular van even more practical. Toyota also has a new van in the works called the Proace City. Its first small van in quite some time, this is a variant of the Citroen Berlingo / Peugeot Partner / Vauxhall Combo Cargo trio, and will also make its world debut at the CV Show in Birmingham. There will be another chance to see the Mitsubishi Shogun Sport Commercial at the same event. This was due to go on sale in 2018 but has been delayed until February this year. Beyond these, the only other brand new vans we’re expecting imminently come from LDV – although exactly when these will appear from China remains TBC. Looking further ahead, Renault’s Kangoo is due replacement sometime soon (probably at the beginning of the next decade), this will mean a change for the Mercedes Citan, and possibly the Nissan NV200 as well. All-new vans aside, there are a number of refreshed models heading to the market soon, including fully revised versions of the Ford Transit, Volkswagen Transporter (T6.1), and Iveco Daily, plus technical updates for the Ford Transit Custom and Mercedes-Benz Vito. Renault's medium Trafic and large Master vans are also due an update, which will mean changes for the Fiat, Nissan and Vauxhall models that are based on them, too. There are several new electric vans also on the way; mostly these are variants of existing models, but the London Electric Vehicle Company (LEVC) is planning a brand new, exclusively electric van for sale in the early 2020s. What new vans have recently gone on sale? The most significant new van to launch recently is really a trio: the Citroen Berlingo, Peugeot Partner and Vauxhall Combo Cargo. All three were on sale as of early 2019, and they impress with their driving experience, load capacity and technology. It’s also impossible to overlook the introduction of the latest, all-new Mercedes-Benz Sprinter earlier in 2018 – chief rival to 2017’s new van stars, the VW Crafter and closely related MAN TGE (the latter coming with truck levels of servicing support, raising the bar in this sector). Ford has also been busy; 2018 saw major updates to the Transit Custom, Transit Connect and Transit Courier, plus an all-new Fiesta Van, which is currently the only car-derived van on sale outside of the commercial 4x4 sector. Speaking of commercial 4x4s, finally filling the vacuum left by the death of the Land Rover Defender, there are now two van versions of the Toyota Land Cruiser, plus a posh Land Rover Discovery Commercial, if you’re feeling particularly flush. The Mitsubishi Outlander PHEV Commercial has received an update in early 2019 as well. 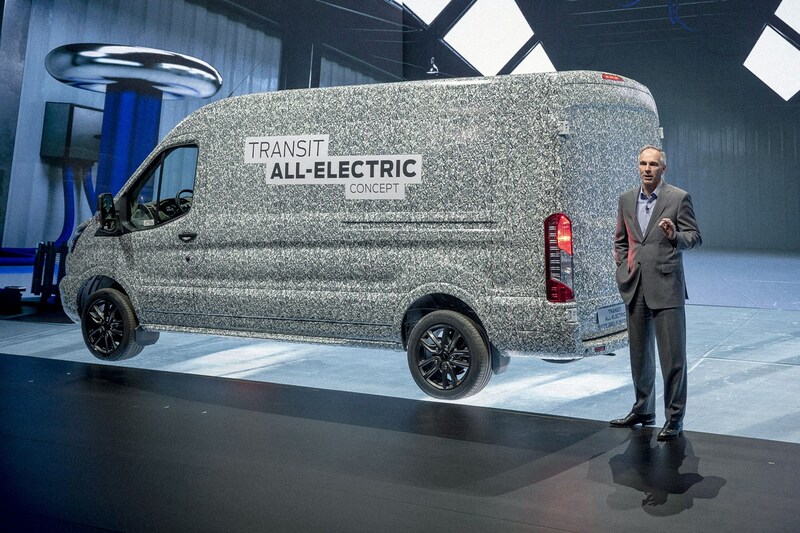 We’ve seen a glut of incoming electric vans in recently, too. The Renault Master ZE became the first mainstream large e-van to go on general UK sale, while the Nissan e-NV200 had a driving range boost that just beats the most recent Renault Kangoo ZE. And there are plenty more electric vans on the way, as we’ll see. While the current Vivaro was only introduced in 2014, an all-new model is on the way in 2019 – and in fact, you can already order it from your local Vauxhall Business Centre. The sooner than normal change-around comes because Vauxhall is now owned by PSA Peugeot-Citroen, which wasn’t keen for its new acquisition to carry on building the Renault Trafic-based Vivaro. The new model will still be built in Britain, at Vauxhall’s Luton factory, and promises greater payload capacity, higher towing ratings and lots of new technology. We should be driving it in June 2019. While this is not an all-new Transit it is a substantial overhaul, which promises not only improved engines (up to 185hp) and on-board tech but higher payload ratings as well. New mild-hybrid (mHEV) diesel engine options should also help you save fuel, as will the 10-speed automatic transmission available on some models at extra cost. There’s also a complete interior refresh and a built-in 4G Wi-Fi modem for cutting-edge connectivity. On sale July-August 2019. Another big update here, as VW’s popular T6 Transporter gets upgraded to T6.1 status – as the German’s are calling the facelifted model. The exterior makeover increases cooling capacity for a revised selection of engines, while the interior is now much more car-like, and available with some very large digital screens and the latest VW infotainment system. Extra tech improves safety and increases connectivity – whether you want it to or not. On sale autumn-winter 2019. Toyota has now officially revealed Proace City as the name of the small van it will launch at the CV Show in 2019, based on the same platform as the Citroen Berlingo, Peugeot Partner and Vauxhall Combo Cargo. The firm has been referring to it as a car-derived van or CDV in official announcements, which is a little confusing (if technically accurate – there are car versions of all three of its cousins that were launched first). Trust us when we say ‘small van’ is much more accurate. Expect the same good driving experience and practicality as the others, boosted by a five-year warranty. We have now driven the 2019 Iveco Daily, which goes on sale in the UK imminently. While it doesn't look dramatically different from the outside - smart new bumper and optional LED headlights excepted - there are plenty of improvements under the skin. This includes fancy new electrically controlled variable geometry turbos, and a new 210hp range-topping model - plus electric power steering and a load of new safety technology as well. It's still a heavy van, which works best at gross vehicle weights beyond 3.5 tonnes. But for towing and heavy duty work it is excellent. The commercial version of the Mitsubishi Shogun Sport 4x4 should finally start reaching customers soon – just in time to replace the current Shogun Commercial, which is being discontinued. Based on an SUV based on the L200 pickup, expect good off-road capability and punchy engines, but perhaps not a huge amount of sophistication. We should be driving this soon. The Transit Custom received a full-on facelift in 2018, complete with revised looks and massively improved cab interior. For 2019, Ford is adding a more powerful 185hp engine option, plus the same mHEV and other tech upgrades that are gracing its Transit big brother. Worthy of its own entry is the Transit Custom plug-in hybrid electric vehicle – a van powered by the unusual combo of a 1.0-litre petrol engine and an electric motor. We’re been reporting on prototypes since 2017, but the full production version will be available for customers to buy in late 2019. A modest upgrade for the Vito, which gains the same Mercedes Pro Connect connectivity system as the latest Sprinter, including a built-in 4G sim card, plus a revised instrument cluster. Vito Tourer passenger carriers also benefit from a new 2.0-litre diesel engine, but we’re yet to learn when this will be available in the van range as a whole. This all-electric version of the Vito goes on sale in the UK in 2019, becoming not only the first electric Mercedes van to properly reach these shores but also the first electric medium van of any kind. We’ve already driven it, and came away suitably impressed. The driving range is only 93 miles at best, however. So if you’re in the market for an electric van of this size but need to travel further per charge and don’t mind trading some payload, we suggest you hang on for the VW e-Transporter, detailed below. The first all-electric Volkswagen van to hit the UK will be the e-Caddy – which will be available to order in right-hand drive in 2019. As with the bigger e-Transporter (coming in 2020, see below), the e-Caddy is being created on VW’s behalf by racing and electrification specialists ABT. It doesn’t go as far per charge or carry as much as an e-NV200 or a Kangoo ZE, but you get to drive a Caddy in exchange, which is a nicer experience than either of those alternatives. Not many details on this yet, but we understand that the Movano is getting a makeover before the end of 2019. At this stage it will be staying based on the Renault Master (see below), rather than switching to the – frankly ancient – Citroen Relay / Peugeot Boxer platform. Expect that change to happen when an all-new Movano arrives around 2022. The Renault Master is the van the Vauxhall Movano (above) is based on - and all forms the basis of the Nissan NV400. As with the Movano, the Master is due a facelift this year, and our spies have recently caught the new model testing in heavily disguised prototype form. This suggests the front end will be getting a pretty big makeover, while changes under the skin are likely to include an upgrade in safety equipment to meet modern standards. We should have some official news on this very soon. The word is the Renault Trafic is also getting a facelift in 2019; the current model (pictured) has been on sale since 2014, so it is about time. This van also forms the basis of the Fiat Talento and the Nissan NV300, so we can expect to see changes to these vans in time as well. The current Vauxhall Vivaro, however, is moving to an all-new platform for 2019 (see above). Set to arrive in 2019 – though as ever with LDV, this could be subject to delay – the EV31 promises to be a purpose-built electric van with a 200-mile driving range. Exactly how that will be achieved and how much payload you’ll be able to carry at the same time remains to be seen, but hopefully we’ll get a further update at the 2019 CV Show. LDV is also planning the launch of an all-new V80 large van (existing model pictured), which is expected to go into production in late 2019 (which means it may not reach the UK until 2020 at the earliest). This will not only have Euro 6 diesel engines – the current V80 is still soldiering on with Euro 5 somehow – but promises both front- and rear-wheel drive variants and a GVW up to 5.0 tonnes. A worthy alternative to the latest Sprinter and Crafter? Time will tell. An all-electric Sprinter has been on the cards since the latest model was launched in 2018 – and we’ve already driven a prototype. The full production version is set to debut in 2020. Expect a refined and potent driving experience, but not an especially large driving range, as it will be targeting urban delivery services. As with the e-Caddy, the Transporter is built by ABT for VW, and arrives in right-hand drive early in 2020. It comes only in LWB form, but you can choose between one or two battery packs – depending on whether you want to prioritise the driving range (up to 250 miles claimed) or payload (up to 1,186kg). Although this is actually the first electric van VW officially announced, the e-Crafter will be the last to arrive in right-hand drive, and is currently expected in 2021. This is because it’s an entirely in-house project, whereas the e-Caddy and e-Transporter are third-party conversions. And also because it’s proving so popular in left-hand drive that production capacity is presently sold out. We’ve already driven a prototype, and like the eSprinter, the e-Crafter will be worth waiting for. Since the MAN TGE is a rebadged version of the VW Crafter, you won’t be surprised to learn that the eTGE is extremely similar to the e-Crafter. UK availability is yet to be confirmed, but MAN will likely follow the same pattern as Volkswagen, and begin offering right-hand drive versions in 2021. Also joining the ranks of large electric vans will be the Ford Transit, following an announcement at the 2019 Ford Go Further event in April. While details are scarce at this stage, Ford is promising that payload and driving range will be 'competitive'. We'll bring you more details as soon as we have them. The London Electric Vehicle Company is the Chinese-backed firm behind the most recent London Taxi, and had been planning to build a plug-in hybrid petrol-electric van based on the same platform – as per the spy shot above. However, that scheme has now been abandoned in favour of an all-new fully-electric van that’s estimated to go on sale in the ‘early 2020s’. We’ve lumped these altogether as they’re the same van with different badges on – although that doesn’t make them entirely identical. Each has slightly different standard equipment levels, while the Partner incorporates Peugeot’s unusual i-Cockpit interior design – which means it has high-set dials and very small steering wheel. The fundamentally impressive aspects of these vans remain present in all versions, though: high payload ratings, good fuel economy, nice driving experience and lots of available tech – including some innovative camera solutions and an overload sensor. This all-new Sprinter is the most connected van we’ve ever seen, with a built-in 4G sim card and the MBUX infotainment system as standard. It’s also comfortable, good to drive and powered by well-proven engines. Payload and fuel economy are still bettered by older rivals, but if you want the best from the large van sector, it’s this or VW Crafter / MAN TGE at the moment, with the 2019 Ford Transit update waiting in the wings. Superb new car-derived van from Ford takes full advantage of the latest Fiesta platform, which makes it good to drive, amazingly refined and available with plenty of creature comforts. The smart-looking Sport version (pictured) is the one to go for, and is proving far more popular with buyers, too. So what if there are no rivals – the Fiesta Van is so good that it would be tough to beat anyway. Huge mid-life facelift for the UK’s bestselling van. It now looks better inside and out, has more in-cab storage, and continues to deliver the greatest all-round blend of ability and payload in the medium van sector. It’s not got the comfiest ride, and other vans offer better on-paper fuel economy, but the Transit Custom remains the mid-size model to beat. What’s more, there are further improvements to come in 2019, including electric versions and a more powerful Sport model. Not as obvious as the Transit Custom facelift, but the Transit Connect has been given a thorough going-over as well. The new 1.5-litre diesel engine is a plus, the poorly implemented eight-speed automatic gearbox option not so much. A funky looking Sport version (pictured) is also set to join the range shortly. Another Blue Oval facelift – this time a mild makeover for Ford’s smallest proper van. A more powerful 100hp diesel engine option and revised interior lead a host of improvements, including moving to a six-speed manual gearbox as standard for the first time. There’s also fuel-saving package with active aero-shutters in the grille on every model – enhancing a van that was already efficient and cheap to run. A new van version of Toyota’s famously robust and capable Land Cruiser 4x4, aiming to fill the void left by the Land Rover Defender. It’s available in short- and long-wheelbase versions, and surprises with its comfort, ease of driving, refinement and performance – if you’re trading into one of these from a Defender you’ll think all your Christmases have come at once. It’s also an interesting comparison to the Toyota Hilux pickup, being more powerful and much nicer to drive, as well as having a more secure – if less practical – load area. Another van version of a 4x4 – this time based on Land Rover’s latest and super-posh Discovery. If you need exceptional off-road capability in combination with smooth on-road driving and lots of high-tech kit, this vehicle is outstanding. It has some well though-out load area solutions as well. It’s not cheap mind, and Land Rover reliability remains a potential hornet’s nest. The Discovery looks mighty good though, either way. This all-electric version of the Renault Master uses the same motor and batteries as the much smaller Kangoo ZE, with predictably limited driving range and performance as a result. It can still carry over a tonne, however, and comes in a choice of body sizes, which is more than can be said for some upcoming rivals. It’s not cheap, but it is the best large electric van solution currently available. Updated version of Nissan’s small electric van impresses with a claimed 174-mile range and a payload rating of over 700kg. It’s a bit roly-poly to drive, but if you want an electric van that doesn’t cost the earth and you want it now, this is the best choice - the Kangoo ZE travels almost as far but has a less powerful engine and even more basic interior.